The sound of Hindugrass is a fresh new voice for Indian fusion, a surprising and engaging festival for the ears in an age where everything has “already been done.” Alternately haunting and soaring sarod melodies intermingle with the sweet twang and bite of instruments from the Smoky Mountains and the rich palette of chamber strings over a driving bed of percussion instruments from around the world, all delivered with delightful virtuosity. 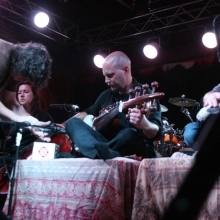 Hindugrass was founded in Los Angeles in 1998 by John Heitzenrater and friends as an acoustic vehicle to explore the commonalities between the classical and folk music of Northern India and the folk and bluegrass styles of Appalachia. Mr. Heitzenrater’s mastery of the sarod and intricate compositions are the core thread of this exciting collective of diverse and talented musicians. 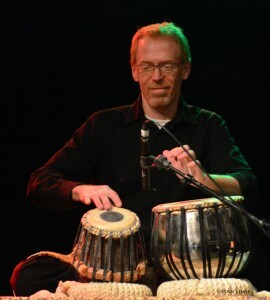 John Heitzenrater is a multi-instrumentalist, composer, and educator whose performance career spans more than three decades and many genres. 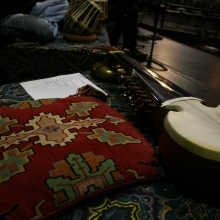 The instrument on which he is featured in Hindugrass is sarod, but he has also appeared performing and in recordings on tabla, bassoon, guitars, bass, ghatam, keyboards, tenor recorder, basketball, darbukka and voice. On sarod, Mr. Heitzenrater is a product of the celebrated Maihar-Allaudin Gharana, which traces its lineage to Mian Tansen, court musician of Akbar the Great and the principle progenitor of modern Hindustani classical music. He studied sarod with Pandit Rajeev Taranath, distinguished disciple of Maestro Ali Akbar Khan and one of the world’s leading exponents of the sarod, and studied tabla with Lucknow Gharana Maestro Swapan Chaudhuri. He is also versed in the folk music traditions of Macedonia and Bulgaria, in Western classical music, and in various American popular traditions including rock, folk, jazz, and bluegrass. In his diverse performance career, he has shared the stage with an array of talented musicians from around the globe, including an appearance at the Dalai Lama’s World Festival of Sacred Music with master South Indian drummer Poovalur Srinivasan, at the Skirball Cultural Center in Los Angeles with chitravina virtuoso N. Ravikiran and master drummers Glen Velez and John Bergamo, and accompanied a solo performance by tabla master Pandit Anindo Chatterjee on harmonium. He has also performed with Michael Stipe and Mike Mills of the group R.E.M., with Jody Stephens of Big Star, Pat Sansone of Wilco, Ira Kaplan of Yo La Tengo, Chris Stamey of the dBs, Mitch Easter of Let’s Active, and was the music director for an acclaimed 2005 tribute concert celebrating the work of Elliott Smith that involved a long list of indie-rock all-stars from NC. 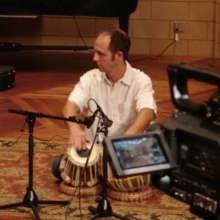 Mr. Heitzenrater earned his Master of Fine Arts degree in Composition and Performance (on sarod, guitar, and bassoon) and his Bachelor of Fine Arts in Multi-Focus Guitar performance from California Institute of the Arts, where he was awarded the Music Teachers National Association “Star” award for his pioneering work with the Santa Clarita Valley Community Arts Partnership. In addition to his performance career, John has scored the short films “A Soaring Life” by Lucas Ridley, “The Finish Line” and “Character Face” by Nic Beery and the feature film “20 Years After” by Kooroc films. He recently completed a full score and sound design for the “Iron Curtain Trilogy” of plays by David Edgar, performed in repertory in Raleigh and London by Burning Coal Theater. 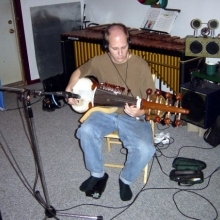 Mr. Heitzenrater is an active teacher with a large studio of private students in guitar, bass, piano, voice, sarod, tabla, composition, theory and songwriting. He has lectured at every major university in central NC, and was on the faculty at North Carolina Central University for eight years, where he taught bassoon, music theory, ear training and music history, and designed and implemented an online course and a seminar on the history and development of 20th century American popular music. Jay Manley is a guitarist, producer, composer and music instructor in Chapel Hill, NC. Manley received his first guitar at eighteen months old and has devoted his life to the instrument. Classical, Hindustani, rock, blues, country and jazz all live happily side by side and can be heard in his playing style. Manley was an A. J. Fletcher Scholar and received a B.A. in music from the University of North Carolina Wilmington. 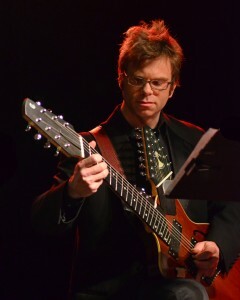 He studied classical guitar under Robert Nathanson, jazz with Frank Bongiorno and composition with Dr. Steven Errante. 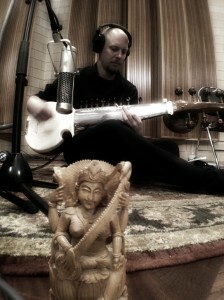 For three years Jay studied the Hindustani or North Indian classical musical tradition under vocalist Madhu Mita Sen Saha. This has led to tremendous musical involvement in the Indian community of Raleigh, Apex and Morrisville North Carolina. He is often spotted accompanying Bengali groups and performing Hindustani influenced music on a custom built 21-string “Saraswati” guitar. 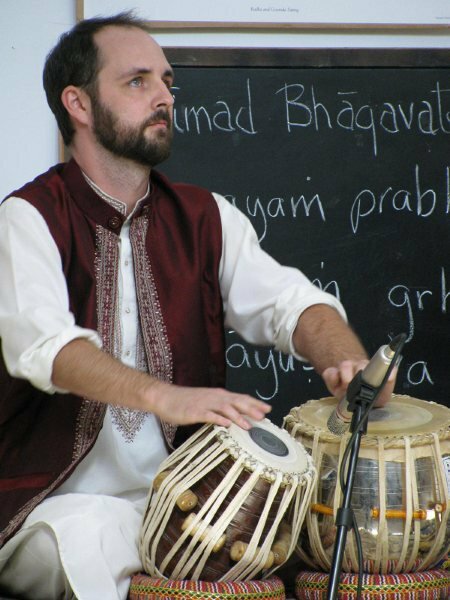 He is currently studying with sarodist John Heitzenrater of the Maihar Gharana. Chris Johnson is a multi-talented musician/ audio engineer/ sound designer/ composer and producer with over 15 years experience covering a diverse range of projects from live performances and workshops to studio recordings. As a multi-instrumentalist, Chris has spent the last 15 years expanding his knowledge and performance skills on instruments from around the globe. Included among these are a handful of the many percussion instruments from India such as dholak, kanjira, moorsing and pakawaj with an in-depth study of the Delhi and Lucknow style of tabla in the tradition of Taranath Rao and Swapan Chaudhuri. Chris has also been a maker and teacher of the Australian aboriginal instrument, the didgeridoo, for 18 years and has performed with many different artists in both live and studio situations. Chris has been the primary tabla player and percussionist for Hindugrass since 2008. 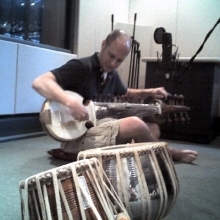 Other recent projects include regularly performing tabla along with North Indian classical musicians such as John Heitzenrater (Sarod), Viswas Chitnis (Sitar) and Jay Manley (Saraswati Guitar). Chris also performed with the Paperhand Puppet Intervention band in the “I Am Insect” and “Hungry Ghost” productions in 2008. Chris co-producing the score for the independent film “20 Years After” with composer John Heitzenrater. 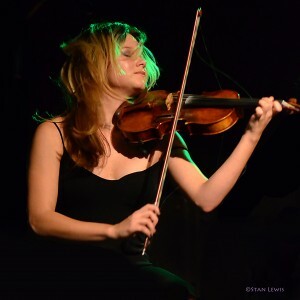 Jenavieve Varga is a classically trained violinist who began playing at the age of three. Her performance studies cover many different genres. 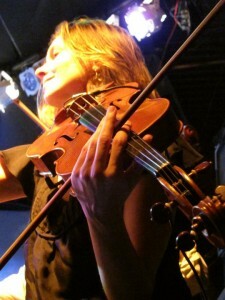 She plays violin for the indie-rock band Lost in the Trees in addition to Hindugrass and various classical engagements. Her versatility transcends into her live performance experience, as she has played with quartets, chamber orchestras, and indie all-star goups; in venues that range from dive bars to outdoor amphitheaters. She studied at The Berklee College of Music in Boston, where her focus in performance studies was in world music, and has studied with members of the Guinerri String Quartet, the Cavani String Quartet and Peter Salaff of the Cleveland Quartet. While in Johannesburg, South Africa, she played the violin and was the director of music for art exhibits curated by William Kentridge and Wayne Barker. Her creative passions also include costume and makeup design, as well as art direction for music videos. 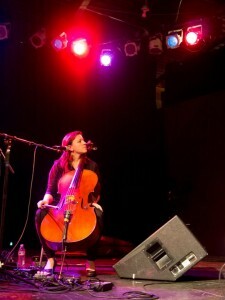 Kathryn (“Katie”) Wyatt is an accomplished musician and new personality in music and social entrepreneurship. Katie co-founded and assumed the post of Executive Director of KidZNotes in July 2010. The mission of KidZNotes is to provide under-served children in Durham, NC, “beginning in the pre-school years, free-of-charge classical, orchestral music training to combat poverty, strengthen inner-city education, and foster positive decision-making to unlock the world.” KidZNotes is based on the model of “El Sistema,” the world-renowned National System of Children and Youth Orchestras of Venezuela, which since 1974 has transformed the lives of over 800,000 Venezuelan children from impoverished circumstances. Prior to her work with KidZNotes, Katie was a member of the inaugural class of Abreu Fellows, an intensive year of study in social entrepreneurship and the curriculum, methods, and philosophy of El Sistema, and innovations in social policy and education in the U.S. Including her work in El Sistema, Katie is a leader in the orchestra field in creating programs for access and opportunity for all children to experience the transformative power of music. She was a keynote speaker for the League of American Orchestra’s National Conference in 2011, and has served as a consultant for a number of seminars and workshops in music and social entrepreneurship including the League of American Orchestras regional seminars, the New England Conservatory Abreu Fellows program, the Cleveland Orchestra, the San Diego Youth Symphony, and the Academy at Julliard. Ms. Wyatt served as Director of Education and Community Engagement for the North Carolina Symphony. From 2007-2009, she created and expanded programs that would inspire and captivate young audiences. She led the growth of the Young Strings of the Triangle, a scholarship program for youth of promise in need of financial aid. In 2006, she was selected to be an Orchestra Management Fellow of the League of American Orchestras, a year-long leadership training program designed to launch executive careers in orchestra management. With this training, Katie has shared her passion for social justice and access to position orchestras as leaders in their communities for creating flourishing cultural opportunities open and available to all. Leading to her work in orchestra management, Katie was a violist with the New World Symphony and the Youth Orchestra of the Americas. Her call to leadership in social justice through the arts was inspired by YOA’s joint performances with Gustavo Dudamel and the Simon Bolivar Orchestra of Caracas, VZ in 2005. The power and success of El Sistema moved her to begin thinking how and where else this passion for music could translate to benefitting communities. Wyatt speaks Spanish and French and holds bachelor degrees in Political Science and Viola Performance from Indiana University and a Master’s Degree in Viola Performance from the Cleveland Institute of Music. She has performed with the the New World Symphony, Verbier Festival Orchestra, Columbus Symphony Orchestra, Youth Orchestra of the Americas, and the Spoleto Festival USA Orchestra of Charleston, S.C., in the major concert halls of the United States, Europe, South America, Japan and Taiwan. Ms. Wyatt lives and works in Durham, NC. 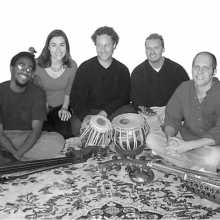 and locally has enjoyed performing with the indie folk-rock chamber orchestra, Lost in the Trees, and the indian-bluegrass fusion band Hindugrass. Leah Gibson is a classically trained cellist hailing from Chapel Hill, North Carolina. She began her studies in her hometown of Orlando, FL with Kathleen Weidley and Shirley Tabachnick, and continued her studies with Brent Wissick at the University of North Carolina in Chapel Hill, receiving her bachelors in music. 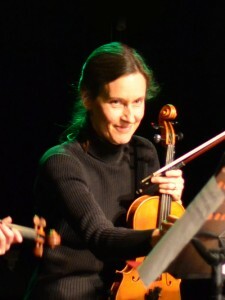 At UNC, Leah played extensively with the UNC Symphony, UNC Baroque Ensemble, and the University Chamber Players. Midway through college, Leah joined a local indie-folk project called Lost in the Trees, fronted by Ari Picker. She has since recorded and toured nationally with the ANTI- recording artist and played with several other local and national acts: The Rosebuds, Bowerbirds, Love Language, Fan Modine, Chris Stamey, and Daniel Hart. In addition to playing with Hindugrass, Leah has her own musical project – Prypyat – with Duncan Webster of Hammer No More the Fingers (Durham, NC). Wiley A. Sykes is a founding member of the Philidor Percussion Group, principal percussionist of the Greensboro Symphony Orchestra, a member of the Grand Teton Music Festival and on the music faculty at Guilford College.He has previously been the assistant principal percussionist with the Oakland Symphony, principal percussionist of the Dallas Wind Symphony and served on the faculty of Appalachian State University.Active in world music, Mr. Sykes has co-directed the Jembe and Dance Institute at UNC Greensboro and has toured as the tabla accompanist for the North Indian sarodist and Real World recording artist, K. Sridhar.He earned his MM from Northern Illinois University, trained in orchestral percussion under James Ross of the Chicago Symphony Orchestra and studied world music and drumming at Wesleyan University.He learned mrdangam with Trichy Sankaran and the late T. Ranganathan, and studied tabla with Pandit Sharda Sahai. Born and raised in Chapel Hill, Laura Thomas attended UNC-CH where she studied with Richard Luby and Ann Woodward. After earning a Bachelor’s degree in Psychology from UNC, Laura moved to Wichita, Kansas to study violin with Andrzej Grabiec and Nancy Luttrell. She won a position with the Wichita Symphony in 1988 where she remained for 10 years. In North Carolina, Laura has played with the Durham, Raleigh, Wilmington, Greensboro and North Carolina Symphonies, Chamber Orchestra of the Triangle, Musica Musicians and Arioso Strings. She is a member of the Tchaikovsky Virtuosi and the Masterworks Reading Orchestra and enjoys freelance work with a number of local groups. She is also a founding member of The BarHop String Quartet and a member of Hindugrass, a band fusing bluegrass and Indian music. Laura can also be found in the recording studio where she has performed on classical, rock and alternative music cds, and several film soundtracks. Laura lives in Chapel Hill with her husband, son and daughter. Since his arrival to Chapel Hill, in 1982, Ed Butler has been a shining light in an already vibrant music scene in North Carolina. Comfortable in all styles and genres, Ed is known to add just the right touch to any musical project. In 1984 and 1986, Ed toured with “The Bo Lozzoff Rock & Blues Traveling Road Show”, which performed at prison facilities throughout the state of North Carolina. 1985-87, he performed with the modern improvisational band, Good Neighbors (a.k.a. Anubis Leisure Society Orchestra.) February 1986, Ed performed in an experimental music concert call “EXP” by Rich Robeson, Chris Turner, and Danny Moses. From March-April 1986, he had his first stint with the theatre. He was the pit percussionist for “Purlie”, a production at Theatre in the Park, Raleigh, NC. And in 1986-89, Ed performed and toured with The Thelonious Society, a middle-eastern influenced jazz quartet, which included a one-month concert tour of Morocco. 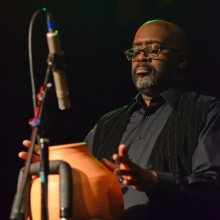 In 1989, Ed Butler began his long musical association with the Tony Award winning Red Clay Ramblers, who Actor & Playwright Sam Shepard called “A great American band” and the Nashville Tennessean called “Acoustic Music Greats.” Ed traveled and performed with the Ramblers all over including The Piccolo Spoleto Festival in Charleston, SC, the Winnipeg Folk Festival in Winnipeg, Canada; both in 1989, the Lorient Festival Interceltique, Lorient, France in 1990, two live radio broadcast of “A Mountain Stage” in 1992 and 2002 for West Virginia Public Radio at the WVA Cultural Arts Building, Charleston, West Virginia, and “A Prairie Home Companion” broadcast live from Carmichael Auditorium on the campus of The University of North Carolina, Chapel Hill on May 25th,1996. In 2005, Ed and the Ramblers collaborated with The Carolina Ballet to perform “A Carolina Jamboree”, a ballet choreographed by Lynne Taylor-Corbett. It was also broadcast statewide for the UNC Center for Public Television on January 25th and February 2nd, 2006. And on January 12th, 2006 Ed and the Ramblers performed with Ralph Stanley and The Clinch Mountain Boys at Memorial Hall, UNC Chapel Hill, NC. During this period with The Red Clay Ramblers, Ed also enjoyed playing and traveling with a variety of artist and acts. From April-June of 1992, he toured the United Kingdom and Europe with Mercury/PolyGram recording artist Michelle Shocked. This also included a performance nationally televised on April 24th on “The Dennis Miller Show” with both Michelle & “Pop” Staples. From January 1993-1997, Ed was the drummer for “The Nancy Middleton Band”, an “alt-country” combo that released two CD’s; “Homeland”, released in 1994 and “The Way I Do”, released in 1996. They were voted as one of the “Best Unsigned Bands of 1996″ by Musician Magazine. The band also opened for Pam Tillis and her band at The Carolina Theatre in Durham, NC on February 16th, 1996. In 1998-99 Ed participated in a variety of performances with The Micro-East Collective, including a festival for new music curated by Eugene Chadbourne, John Zorn, and Vernon Reid at The Tonic in NYC. And on December 31st, 1999 with the jazz trio, Blue Combo started the festivities for The BeeGees at The National Car Rental Center in Ft. Lauderdale, Fl. Ed has also scored the music, performed, and even acted in a variety of theatre projects. Oct-Nov 1989 he composed & performed the music for Virginia Polytechnic Institute’s production of “Electra”, directed by Bob Leonard. From April of 1996 through June of 1998, Ed played the characters Purvis and Masayuki Kabuki in “Kudzu-A Southern Musical” written by Pulitzer Prize winner Doug Marlette and The Red Clay Ramblers. The show was performed at The Center for the Study of The American South, Chapel Hill NC, the National Alliance of Musical Theatres Festival of New Musicals in NYC, The Norma Terris Theatre, Goodspeed at Chester, Connecticut, The Reynolds Theatre at Duke University, and at Fords Theatre in Washington, DC. In April of 1999 he performed in the Raleigh Little Theatre’s production of “Always Patsy Cline.” From August 1996 to March 2000, composed and performed the music for Jelly Educational Theatre, a Chapel Hill children’s theatre company, winners of the 2000 Indie Award for Excellence. Ed also composed and performed the music for Playmakers Repertory Company’s 2002/2003-season finale adaptation of Oscar Wilde’s “Salome” directed by Trezana Beverly and choreographed by Sandra Burton. He is also worked on a dance project with L.D. Burris and Keval Kaur of “2 Near the Edge” and Gaelic scholar and author Michael Newton on the collaboration of two traditions: The Jonkonnu, an African/Caribbean celebration, and The Oiche Challun, a Gaelic or Scottish Highland celebration. Currently Ed is the drummer and percussionist for Ira David Wood’s production of “A Christmas Carol” at Memorial Auditorium, BTI Center, in Raleigh, NC. Other current projects featuring Ed are: The Bernie Petteway Trio, a modern jazz group featuring Bernie Petteway on Guitar and, Robbie Link on Bass. He’s a member of Contrazz, a contra dance band that combines the improvisational style and swing of a jazz band with a repertoire of traditional Celtic, Quebecois, and American Old-Time music. This high-energy ensemble is known for its driving rhythms, hot music and have performed for dances and concerts across the United States. Sidecar Social Club is a jazz quintet featuring vocalist Lisa Veronica Wood, F.O. Finch on woodwinds, Aaron Bittikofer on bass, and Jim Crew on piano and accordion. Hindugrass, founded in 1998 by John Heitzenrater on Sarod, is a fresh new voice for Indian Fusion, exploring the commonalities between the classical and folk music of Northern India and the folk and bluegrass style of Appalachia. 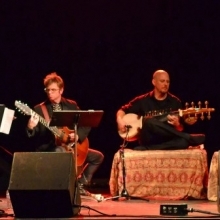 Yet his most ambitious project to date is Ecco La Musica (formerly ELM Collective), a fusion of jazz, chamber, and world timbres and rhythms with Tango, Arabic and Mediterranean overtones. This is a collective of composers and musicians dedicated to the performance of new and original music. Their CD, “Morning Moon”, was released by Parma Recording on the Big Round label.